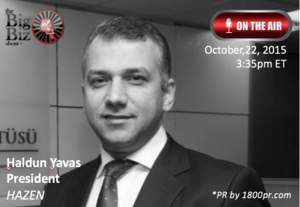 HASEN - Hazar Strategy Institute President Haldun Yavas to Be Interviewed on "The Big Biz Show"
Haldun Yavaş graduated from Kültür College and received a Bachelor of Science degree from the University of Marmara, Department of Chemistry, Istanbul. He earned Master's Degree in Science Education from Dowling College in New York. He also completed Harvard Kennedy School Executive Education Program of Strategic Management for Leaders of Non-Governmental Organizations. Mr. Yavaş is the owner of Hazar World, Journal of Caspian Affairs and Caspian Report journals on behalf of the Institute. He is an active member of international non-governmental organizations such as Clinton Global Initiative, a non-partisan organization that convenes global leaders to devise and implement innovative solutions to the world's most pressing problems. He is also a member of Chatham House, the second most influential think tank throughout the world. He has been the chair of "Caspian Forum 2012" held in Istanbul, Four Seasons Hotel on December 5-6, 2012; "Caspian Forum New York 2013" held in Waldorf Astoria Hotel on September 25, 2013; "Caspian Forum 2013" held in İstanbul, Ciragan Palace on December 4-5, 2013; and "Caspian Forum Brussels 2014" held at the European Parliament on March 5, 2014.